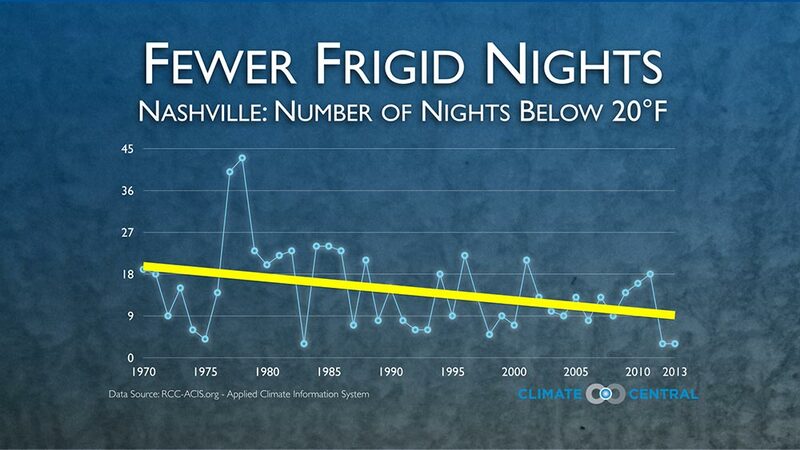 As another arctic blast of cold air descends on Tennessee, no doubt there are plenty of wingnuts in our midst contemplating frigid temperatures as proof of the giant socialist left-wing conspiracy that is global warming and climate change. So let’s take a moment to remind our scientifically challenged fellow citizens that (a) a colder than usual winter disproves nothing about climate change, and (b) the particular source of recent cold weather might actually be a result of climate change. As the climate science and journalism outfit Climate Central has recently documented, this month’s North American deep freeze highlights the fact that intense cold now happens much less frequently than it used to. Climate Central calculated the number of nights below a specific temperature threshold for dozens of U.S. cities based on the local climatology and current weather conditions. The calculations encompass the entire winter season, and show that overall there is a downward trend in the number of extreme cold nights like we’re currently experiencing — although there are variations in a few cities. This trend is consistent with climate studies showing that overall, winters across the contiguous U.S. have warmed by .61°F per decade since 1970, and every region has warmed at least somewhat over that time. Here’s what it looks like for our fair city. Obviously the graph will spike up a bit when the present winter is accounted for, but the long term trend is pretty hard to miss. In global terms, Climate Central points out, there has not been a below-average temperature month (any month) since February 1985, which means that “anyone younger than 28 has never experienced a colder-than-average month, globally speaking.” Will January 2014 end the streak? According to CC, while it may be downright chilly here in our fair hemisphere, global patterns suggest January is not on course to pull it off.